Ajit Viswanathan (third from left) with the Doctible team. The Affordable Care Act, or Obamacare, has drawn its share of criticism, but it has also created opportunities for entrepreneurs. Doctible is helping Americans on high-deductible plans cut the cost of a doctor’s visit by paying cash. Times of San Diego spoke with CEO and Founder Ajit Viswanathan about the two-year-old company, which just graduated from the EvoNexus incubator program. Why did you start Doctible? Quite honestly, Doctible was founded out of my own personal experience and frustration with today’s healthcare system. Three years ago, I injured my knee during a marathon and I went in for an MRI. I assumed my health insurance would adequately cover for the cost of the MRI, so I didn’t ask any questions about cost. You can imagine my shock when I received a $1,300 bill. Why so expensive? Because I, like many others, have a high-deductible health insurance plan. This bothered me so much that I started doing some research. I found that the same MRI procedure only would cost $450-$650 at another San Diego healthcare provider if I paid cash. Digging in deeper, I found that cash pay rates are typically 14 to 70 percent less than my insurance rates. The big problem is none of this information is organized or easily accessible. Doctible was started to tackle this problem. Can you explain how your cash-pay provider network works? 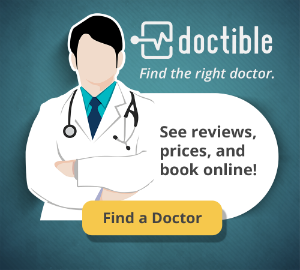 Doctible recruits the best healthcare providers in the San Diego area and publishes their profile, the services they provide and the cash rate they charge for that service. The website is free to consumers and the process is similar to Expedia, where a person can easily search and compare between providers based on location, reputation (patient reviews) and view the cash rates. Should a consumer choose to use their insurance, that’s an option as well. Once a provider is selected, consumers see any open appointment slots and can make a booking with just a few clicks. Doctible saves consumers time, eliminating calls to providers, waiting on hold, etc. We differentiate ourselves from our competitors by exposing cash rates for medical services. It’s been interesting to see that 67 percent of consumers who use our system choose to pay cash, while the other 33 percent utilize insurance. We target the 70 million Americans, ages 24-45, who are on high-deductible health insurance plans, commonly called bronze and silver, with a deductible of $1,200 per year or greater. To reach our target group, we market directly to consumers, as well as reaching them thorough employers and large associations. Employers and associations use Doctible as price transparency and cost saving tools to complement their existing health benefit packages, saving them hard-earned money. We are used more by women (62 percent) than men (38 percent), which is consistent with research showing women as the decision-makers for household healthcare expenses. Geographically, we are focused on the San Diego market for the rest of 2015 and will expand into Orange County and Los Angeles in January 2016. Do doctors or other healthcare providers prefer this approach to dealing with insurance companies? Absolutely. There is a tremendous amount of overhead associated with taking an insured patient. Healthcare providers have to verify patients’ insurance, code and file claims using a cryptic coding system, wait for the insurance company to mail an explanation of benefits and then chase the patient for 30 to 60 days afterwards to collect payment. Many times, there is a balance due by the patient, and 4 to 8 percent of those balances end up in collections, further decreasing the amount doctors actually collect on a service. A patient who pays cash for a service is gold to most healthcare providers. Has passage of the Affordable Care Act helped create a market for Doctible? Yes. In 2010, approximately 27 percent of employees were on high-deductible insurance plans. That number grew to 38 percent by 2013. The ACA started in 2013, accelerating those market forces that were already in motion. The ACA has injected 10.2 million Americans into the healthcare system on high-deductible plans. These people will be paying out of pocket for a majority of their non-acute care before insurance kicks in. The scary part is that the average bronze plan deducible for an individual is now $5,181 and $10,545 for a family. Silver plans aren’t much better with $2,927 for an individual and $6,010 for a family. That’s a lot of money, requiring everyone to be very judicious about their health-care spending. We believe Doctible will become a great tool for consumers to leverage in the future.